Leaderboards are a visualization of achievement. The purpose of a leaderboard is to show people where they rank in a gamified system. 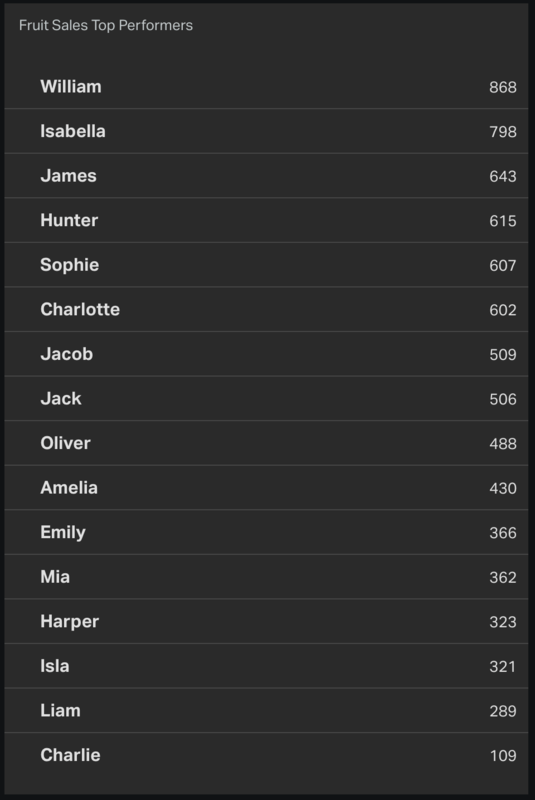 The leaderboard shows them where they stand in relation to their peers. Measuring Progress / Achievement: Leaderboards provide a way to visualize your skill progression. As you improve, you get higher scores, and you're able to compare them with past performances. Status: Many people are motivated to keep improving because seeing your name on a leaderboard provides status. Providing a sense of what's possible: In a global, absolute leaderboard, the highest score gives you a sense of what's possible. If you know the person at the top has a score of 900 points, you'll know it's at least possible to increase your skill to reach that higher score. Leaderboards should always be encouraging, never discouraging. If you have a data set that is best represented by an ordered list and find it especially useful to indicate which items have risen and fallen in relation to other items in the list, then a leaderboard is an ideal and robust choice. A common use for a leaderboard could be to represent a sales team. Each item in the list would represent a sales person and their sales over a period of time. A leaderboard could also be purposed to display the downloads of software products from a company's website: each product would be listed with the total number of downloads in a given term and, if you choose, how each product has increased or decreased in popularity in comparison to the other products. A leaderboard consists of a ranked list of items each with a label and optionally a value. Each item may have a previous ranking value to which the current value is compared and indicated with either a green up arrow for an item that has risen in rank or a red down arrow for a list item that has fallen in rank. Decide on a clear title. The title should be a brief description of the data that you want to show. Locally: Players see their rank in relation to that of others in their geographic area. Contextually: Sets up the leaderboard to show leaders by category. Time: Sets up the leaderboard to show, for example, weekly or monthly leaders. Use the Decimal Places feature to manually set the precision of numbers in your widgets, so that you can show the level of detail appropriate for your dashboard. If needed, you can also override our automatic settings for what abbreviation and unit to show. Abbreviation, Decimal Places and Unit are part of the "Fine-tune" settings. Abbreviation: Numbers can be shown in their raw state, or as Thousands (K), Millions (M), or Billions (B). Unit: Allows you to manually enter any prefix or suffix up to 3 characters long. This means if you’d prefer to display your currency differently to our default option you now can. As examples you might want Swedish Krona to show as 100 Kr instead of SEK 100, or New Zealand Dollars to just have the $.